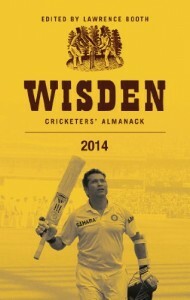 Posted by legsidefilth	on Apr 10th, 2014	and is filed under cricket, wisden. Thanks, Bill – that’s extremely kind of you. I just figured it was time, really. Thanks so so much for the mention. Can’t believe I’m in Wisden! I had to give up my job at Lord’s and now work in a dull but difficult admin job due to a stubborn commitment I have to a thing known as ‘rent’. Rather depressing state of affairs, but thanks to you I now have evidence that I once did something truly worthwhile. “Life is what happens while we’re making other plans” – I know that feeling well. Your blog was a joy to read; I doubt there was anyone who read it who – like me – wasn’t at least a little bit jealous! Best of luck in your future endeavours, and yes, we’ll always have “the little Yellow Book”. My article for Wisden was a retrospective, written at the end of 2013, highlighting the blogs that, in my opinion, had the most trenchant and interesting things to say about issues which arose that year, or aspects of the game which I felt deserved wider attention. It is the nature of blogging that sites come and go; one of the bloggers I listed sadly passed away last year. With the English summer getting into full swing, perhaps enthusiasms will revive (including mine after the recent dreary controversies) and keyboards will be revved up once more. Dude, why did you stop writing. I came across this blog today and even without the benefit of prolonged exposure, I already know that it is among the most entertaining cricket writings which I have ever come across. Oh well, the old order changeth…..